Jell-O and Mormonism: The stereotype’s surprising origins. Why do we associate the religion with the gelatin dessert? The foods I routinely ate growing up Mormon in Utah—pie, fudge, zucchini, potatoes, homemade bread—did not make the cut. Instead, a gelatin-based snack food commonly associated with lowbrow cooking became the shining example of Utah cuisine. Where did this oddly specific stereotype come from, and what does it mean to label a group of people—especially a religious minority—with any one food? If you believe the contemporary Jell-O mythos found in books like The Essential Mormon Cookbook: Green Jell-O, Funeral Potatoes, and Other Secret Combinations, Green Jell-O & Red Punch: The Heinous Truth! About Utah!, and No Man Knows My Pastries (a humorous Mormon cookbook featuring a “Jell-O Matrix” aimed at helping readers connect flavors with potential add-ins), Mormons for decades have consumed Jell-O as fervently as they avoid coffee. But glancing back into history reveals the relative newness of this stereotype. For example, a 1969 New York Times article on Mormon foods contains no mention of the jiggly dessert. A 1988 New York Times article, “What’s the Hot Item in Town? Depends on the Town,” associates Salt Lake City with bubble gum, Cracker Jack, and Kraft macaroni and cheese, while Des Moines, Iowa, is credited with being No. 1 in consumption of Jell-O (and, incidentally, Skippy peanut butter). That same year, a Minneapolis Star Tribune columnist identified funeral Jell-O as “an undying tradition in the Lutheran Church.” How, in the intervening years, did Mormon identity become so closely linked with Jell-O? Surprisingly—or perhaps not—a marketing campaign seems to hold the answer. Post-World War II America saw young mothers uprooted from the supportive community structures that had facilitated child-rearing for earlier generations. Eager marketing executives stepped in, touting processed items like Jell-O and its culinary cousins (think cake mixes and canned and frozen foods) as the perfect solution to any young mother’s problems. Like their counterparts throughout the United States, women in Utah embraced many of these new foods. Unlike many of their counterparts, they made these foods part of a long-standing tradition of home storage that continues today. Between the 1960s and the 1980s, Jell-O experienced slipping sales as American consumers abandoned the traditional meal structure of the early and mid-20th century. Desserts and fussy, structured salads, both ideal dishes for using Jell-O, became special-occasion, not everyday, items. Marketers blamed this shift alternately on decreasing family size and the “fast-paced” lifestyle of American consumers, who depended increasingly on prepared foods. Underlying both was the reality that women were expanding their work sphere to include out-of-home professions. Those disappointing Jell-O sales numbers led General Foods executives to tell the newly appointed marketing manager, Dana Gioia (more recently known as the poet appointed by George W. Bush to head up the National Endowment for the Arts), that his job was simply to minimize the decline of the business line. However, a 1986 market survey found that mothers with young children rarely purchased Jell-O and suggested that General Foods could promote gelatin-based desserts by linking family life and home-produced desserts. In response, the marketing team revisited the plethora of Jell-O recipes accumulated over the product’s lifetime. One recipe for Jell-O cut into shapes that could be picked up and eaten with the fingers stood out. Focus groups loved this easy-to-make recipe, dubbed Jigglers. A multipronged marketing blitz followed. Grocery store giveaways, magazine advertisements, and commercials starring Jell-O spokesman Bill Cosby (and a multitude of smiling kids) all sought to reposition Jell-O not as a dessert, but as a tactile treat that brings together parents and children. The Jigglers marketing campaign gained national recognition for its astounding success. Not only did it prevent Jell-O’s death, but it also made the dessert thrive. Sales bounced back across the nation—aided in part by the fact that the recipe for Jigglers required four times as much Jell-O as the recipe for standard Jell-O. As a state with one of the highest birth rates in the nation, Utah is and was an ideal market for foods aimed at families. With their family-friendly playfulness and ease of preparation, Jigglers were a hit with Utah children. More small mouths meant more boxes of Jell-O sold. Despite the success of Jigglers in Utah and elsewhere, by the late 1980s and early 1990s, Jell-O had gained a slightly tarnished image after becoming a key component of college-life frat parties (thanks, Jell-O shots) and something to be legislated against (as some cities banned Jell-O wrestling contests). A family-friendly refocusing of the brand’s image was needed, and the 100th anniversary of Jell-O in 1997 provided the perfect excuse. As part of the festivities, Kraft Foods (having merged with General Foods in 1988) released per capita sales figures of Jell-O to newspapers around the country. Salt Lake City came in as No. 1. The Utah capital’s reign was short lived. Only two years later, Des Moines, Iowa, edged out Salt Lake City for the No. 1 spot. But by then, the popular association of Utah and Jell-O had jelled, both inside and outside the state. Scott Blackerby, the then-executive chef at Salt Lake City restaurant Bambara, sponsored a “Take Back the Title!” contest in May 2000 and encouraged Utahns to submit their Jell-O creations to compete for prizes that included boxes of Jell-O. A group of students at Brigham Young University campaigned throughout the year for official recognition of Utah’s love of Jell-O, and in 2001, state Rep. Leonard M. Blackham introduced State Resolution 5, “Resolution Urging Jell-O Recognition.” The legislation was passed with only two dissenting votes, and Jell-O became enshrined as the official state snack, a fact bemusedly noted by journalists around the country. 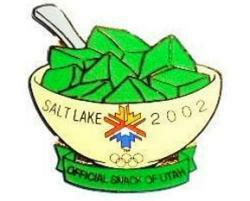 Articles leading up to the Winter Olympics further encouraged popular perception of Utah as the Jell-O state. However, what got lost in the media attention was the fact that the Utahns’ apparent love of Jell-O was less a reflection of the values of Mormon subculture than of the ascendance of processed foods—a process that had been taking place nationwide since the beginning of the 20th century. What, then, does a stereotype about Jell-O consumption do? It is notable that Utah became intimately linked in the national psyche with Jell-O consumption at a time when Mormonism began to exhibit a more open face to the world. Under the tenure of the media-friendly President Gordon B. Hinckley between 1995 and 2008, the Church of Jesus Christ of Latter-day Saints authorized an increasing number of interviews to the national and international press. As the perceived strangeness of Mormons’ religious practices became widely known, it was inextricably tied to the perceived strangeness of their culinary habits. Marking one type of food as strange and another as normal creates boundaries between groups. It draws the line between “us” and “them.” In focusing on the strangeness of Mormon food (or any group’s food) instead of commonalities, media attention further strengthened the stereotype of Utah Mormons as Jell-O eaters. Interestingly, explanations for this stereotype regularly link back to Mormons’ avoidance of alcohol, tea, and tobacco. In a nation where turning 21 is a rite of passage into adulthood, any group that willfully chooses to abstain is seen at best as odd and at worst as juvenile, unable to access the pleasures associated with adult life. The stereotype of Mormons as strangely enamored with Jell-O, a food intimately linked with the relatively powerless realms of womanhood and childhood, reinforces the perception of Mormons as childlike. Consuming Jell-O becomes a kitschy, naïve, infantile practice that on some level prevents Mormons from being taken seriously as full-fledged citizens. In adopting and making Jell-O “their” food, Mormons (or Lutherans or Methodists) are making a statement about their identity, accepting all of the food’s positive connotations of family-friendliness, child-centeredness, and domesticity. Outsiders, in contrast, often look in and see Jell-O as a mark of a lack of taste that renders this group strange, immature, and ultimately mockable.